Western blot analysis of extracts from mouse and rat brain using α-Synuclein (D37A6) XP® Rabbit mAb. 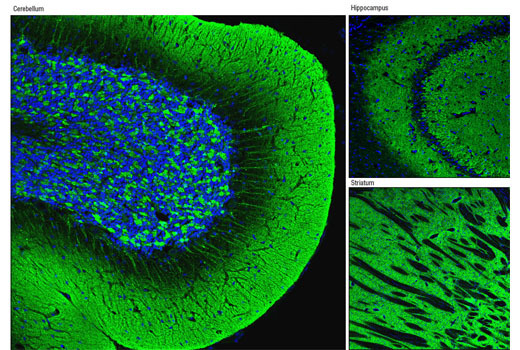 Immunohistochemical analysis of paraffin-embedded mouse brain using α-Synuclein (D37A6) XP® Rabbit mAb. Confocal immunofluorescent analysis of normal rat cerebellum, hippocampus and striatum using α-Synuclein (D37A6) XP® Rabbit mAb (green). Blue pseudocolor = DRAQ5® #4084 (fluorescent DNA dye). 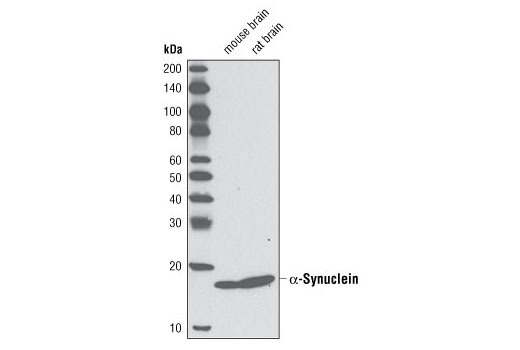 α-Synuclein (D37A6) XP® Rabbit mAb detects endogenous levels of the α isoform of synuclein. Monoclonal antibody is produced by immunizing animals with a synthetic peptide surrounding Glu105 of mouse α-synuclein protein. α-Synuclein is a protein of 140-amino acids expressed abundantly in the brain. 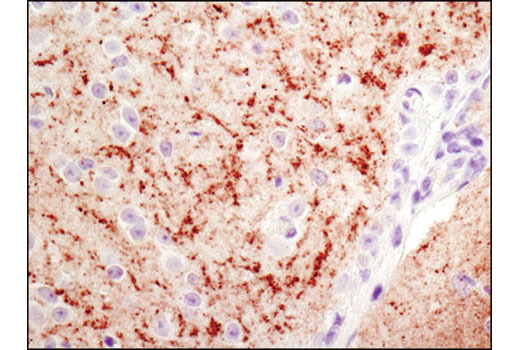 α-Synuclein is also the main component of pathogenic Lewy bodies and Lewy neurites. Research studies have shown that mutations of the α-synuclein gene are linked to Parkinson's disease (1).